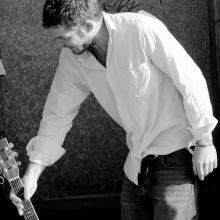 Aaron Dillon is a Cork-Based Songwriter and performer. Originally from Drogheda he has performed to packed houses in ,The Triskeel,The Everyman Palace Theater and The Opera House. In 2005 Aaron spent the summer touring Italy and received rave reviews from the Italian music press. On returning home he has supported many established artists such as Iron & wine, Joan Armatrading, Mick Flannery and former members of venerated Irish folk legends Planxty. He has also performed as a guest vocalist (Take it on the chin) and as Harmonica player (In the gutter) on Mick Flannery's debut album "Evening Train". Having lived, worked and performed in as far off places as Brazil, Sri Lanka, Paraguay, Tanzania, Denmark, The US and Australia helped hone Aaron's unique delivery and stagecraft. Having just recently released his eagerly awaited debut album "Brown Envelope" his music has described as Rootsy mix of Traditional and Urban Folk with strong melodies and thought provoking lyrics. Reviewers have described him as a "writer with the lyrical audacity you don't often here amongst Ireland's current crop of Songwriters" & "A writer who writes on subjects that other writers wouldn't dare,with an abundance of poetic flare,humor and sensitivity to back it up".